Whilst Shutter Island was a completely pedestrian and generally disappointing thriller from Scorsese, I had high hopes for Hugo. Above all, this was a film that was in love with film – what could go wrong? A lot, it seems. Whilst it may boast an enviable budget and impressive production values, Hugo manages to be just as tedious and predictable as Shutter Island. 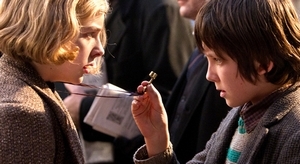 Young Hugo Cabret (Asa Butterfield) lives in a Paris railway station, scampering through the rabbit warren of tunnels and secret passages to ensure that the clocks are kept in proper working order. He has a fascination for all things mechanical and when he gets caught stealing from the local grumpy toymaker (Ben Kingsley), he finds that the two of them have more in common than he originally thought. Hugo is a film that’s enamoured with the early days of cinema, and it shows. It’s not only obsessed with the works of Georges Méliès but recreates some of his most famous films. One action sequence even deliberately uses scale models instead of resorting to CGI, just to prove that the old methods are the best. In a way, Hugo is a technical marvel and a great marriage of techniques old and new. The CGI blends wonderfully with the practical effects, and whilst there are a lot of whiz-bang visual effects being thrown at us, the editing is decidedly old-school and is cautious not to bombard the viewer with too much at once. It has been said before that Avatar was probably the only film that really deserved to use modern 3D technology; I would add Hugo to that exclusive list. Every single shot has been designed with 3D in mind. Whilst the current trend can be seen as a kind of carnival sideshow-like attraction, this film at least has an excuse: the works of Méliès were exactly that. So let me make it clear: I have no problem with the construction of Hugo. It is the storytelling itself that disappoints. The film is decidedly sluggish and predictable. I could anticipate the narrative’s every step and I knew exactly what to expect from scene to scene. The pacing is terribly slow and even the performances are found to be lacking. Chloë Grace Moretz is fantastic, as usual. In fact, she’s the only one that really impresses. Asa Butterfield looks right for the title role but isn’t particularly memorable, while a whole host of historically brilliant actors turn in perfunctory performances. Ben Kingsley, Ray Winstone, Emily Mortimer, Christopher Lee and Richard Griffiths are particularly unmemorable, and even Sacha Baron Cohen’s performance as the station inspector is inadequate. The critical acclaim surrounding the film and its inclusion in the Oscars shortlist leaves me wondering if it is purely the thematic content of the film (its obsession with Méliès) that had such an impact on the opinions of those of import. Hugo is a film that looks and sounds great, and it’s clear that a lot of love went into making it, but the humdrum storytelling leaves a lot to be desired. This entry was posted in Film Reviews and tagged Fantasy, Period Drama, Steampunk by Stuart Wilson. Bookmark the permalink.